In early November 2015, dense fog disrupted air travel in London and central Europe. The Moderate Resolution Imaging Spectroradiometer (MODIS) on NASA’s Terra satellite acquired this natural-color image of the low-hanging clouds on November 1. 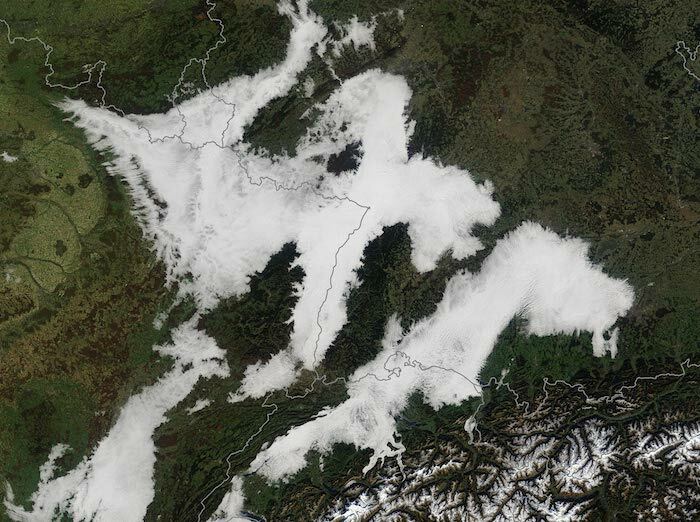 The clouds are low in altitude and appear very bright in the satellite image—a classic characteristic of fog, according to Roger Davies, a cloud and climate scientist, and Buckley-Glavish professor at the University of Auckland in New Zealand. The brightness is a result of fog’s composition. Water droplets are much smaller than those found in a typical water cloud, allowing the cloud to more efficiently scatter light, and “creating a major hazard to visibility,” Davies said. The limited visibility caused dozens of flight cancellations at London’s Heathrow Airport and delays across Europe, according to news reports. Ground-based photographs of the fog in London can be seen here and here. Fog develops over land when the humidity is high and the sky is initially clear, especially as the nights get longer in the fall.